Last October, a wild discovery was announced: Researchers had uncovered a new hominid species on a remote Indonesian island. In a large limestone cave on the island of Flores, the researchers found a skull, jawbone, pelvis and leg bones of an adult female hominid that they subsequently dated to about 18,000 years ago. In the flurry that followed the Oct. 28 Nature paper, scientists speculated about whether the diminutive hominid, referred to in the press as the hobbit, was a new species or whether it was a Homo sapiens with an abnormality  and what either conclusion might indicate about human evolution. Researchers have compared the braincase of a new hominid find (left) to modern humans (right), as well as to chimps and other hominids, to try to determine if it is indeed a new species of diminutive hominid that lived 18,000 years ago. Image courtesy of Peter Brown. By studying the hominids relatively small skull and models of its brain, paleoanthropologist Dean Falk of Florida State University in Tallahassee and colleagues decided that this human is indeed a new species, Homo floresiensis, as described in the March 3 Science Express. The team made several 3-D models of the cranial cavity and compared the brain size and structure to those of other animals, including other hominids, chimpanzees and modern humans with microcephaly, a condition involving an unusually small head and mental defects. 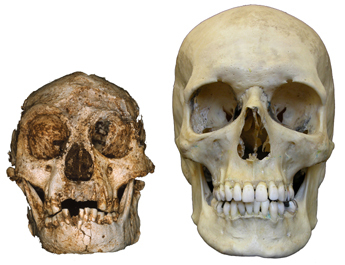 The brain size of this H. floresiensis female was about 417 cubic centimeters  about one-third of the average brain size of modern humans, Falk says. The brain size is actually about the same as that of the famed Lucy, an Australopithecus afarensis. But the brain shape of H. floresiensis is quite different from Lucys and is actually most like that of Homo erectus, the first species of the genus Homo, Falk says; the shape least resembles that of modern people with microcephaly. Any future finds, however, are not going to upset the applecart of human evolution, Holloway says. We have long known that there must have been other hominids out there, Klein adds. Peter Brown, a paleoanthropologist at the University of New England in Armidale, Australia, who was part of the original discovery and research team, says that the team has been back in Indonesia, looking for more examples and evidence of the miniature hominid and have found remains of at least eight H. floresiensis individuals. When analyzing the specimens, however, Brown cautions that it is the combination of traits, not a single trait such as brain size, that can elucidate a specimens identity.